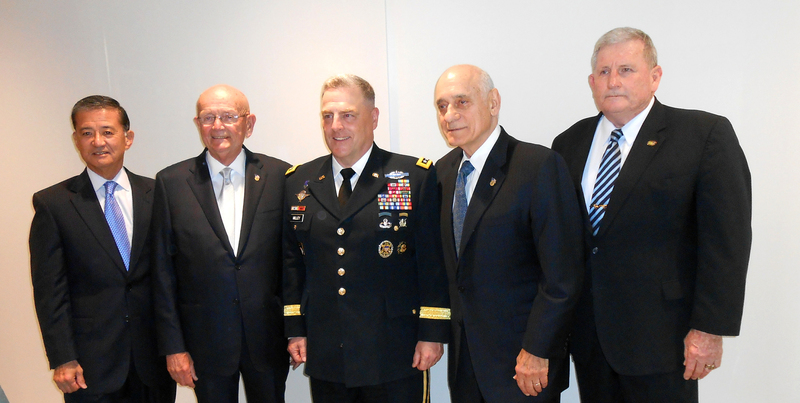 Five Army chiefs of staff – the current one and four former Army leaders – were present June 17 for a reception marking the departure of the Association of the U.S. Army’s president and CEO. The event, held in AUSA’s Conference and Event Center in Arlington, Va., was held to mark the end of an 18 ½-year era in which retired Army Gen. Gordon R. Sullivan served as the head of the educational nonprofit. Sullivan, who was the Army’s 32nd chief of staff, steps down on June 30. His successor is retired Army Gen. Carter F. Ham. The current Army chief, Gen. Mark A. Milley, was at the reception, and so were three other retired Army four-stars who have served as chief of staff: Gen. Peter J. Schoomaker, the 35th Army chief who served from 2003 to 2007; Gen. Eric K. Shinseki, the 34th Army chief who served from 1999 to 2003; and Gen. Carl E. Vuono, the 31st Army chief who served from 1987 to 1991. Secretary of the Army Eric Fanning and other current and former Army leaders also attended the reception. Sullivan, who retired from the Army in 1995 after more than 36 years of service, joined the AUSA in 1998. He’ll continue to serve as chairman of board of the Army Historical Foundation.